With less than 10 hours of sunshine December 2017 here in North Rhine–Westphalia (a state in Germany were I live) was was one of the darkest Decembers since weather recordings began about 100 years ago. Actually it was one of the darkest winters ever for some parts of Europe. And I know that months of eating chocolate won’t be good for me for many reasons and so last weekend I looked for some healthy alternatives. 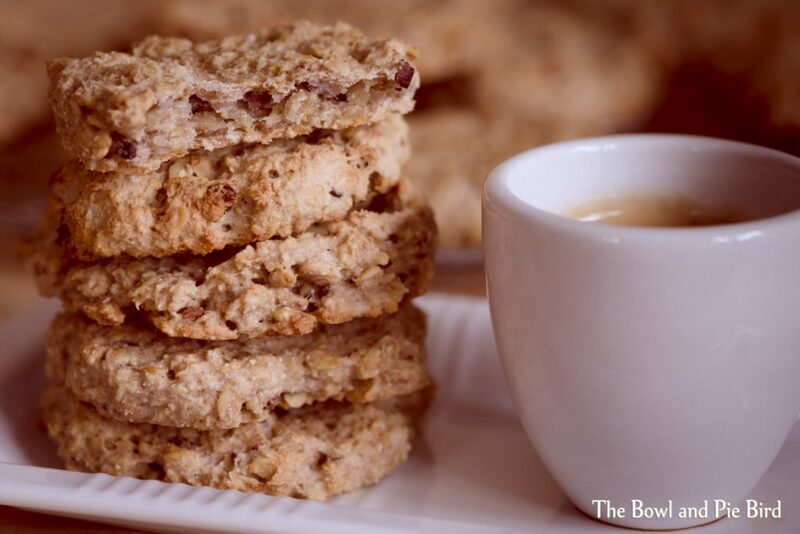 And found this super simple recipe for some super quick biscuits on Nia Latea’s blog. And with no added sugar they are healthy too. Yeah! I changed the original recipe a bit as I added a tablespoon of cacao nibs (I can’t quite go without chocolate it seems). And whilst shopping I picked up a bag of coconut flour which I have been seeing a lot in various recipes recently and wanted to try it out. * I didn’t have any ready made apple sauce so I peeled a small apple, coarsely chopped it up and popped it into the microwave with a dash of water for about 1 min until it was soft. Puree with an immersion blender or squash with a fork. Voilà apple puree! Using an immersion blender mix up your peeled bananas, margarine and vanilla extract in a bowl. If you don’t have an immersion blender, mash up the bananas on a plate with a fork until they are really soft and you can’t feel any lumps. Beat the margarine in a separate bowl with a hand mixer for 1 minute until soft and then add bananas and vanilla extract and mix for 1-2 mins until well combined. 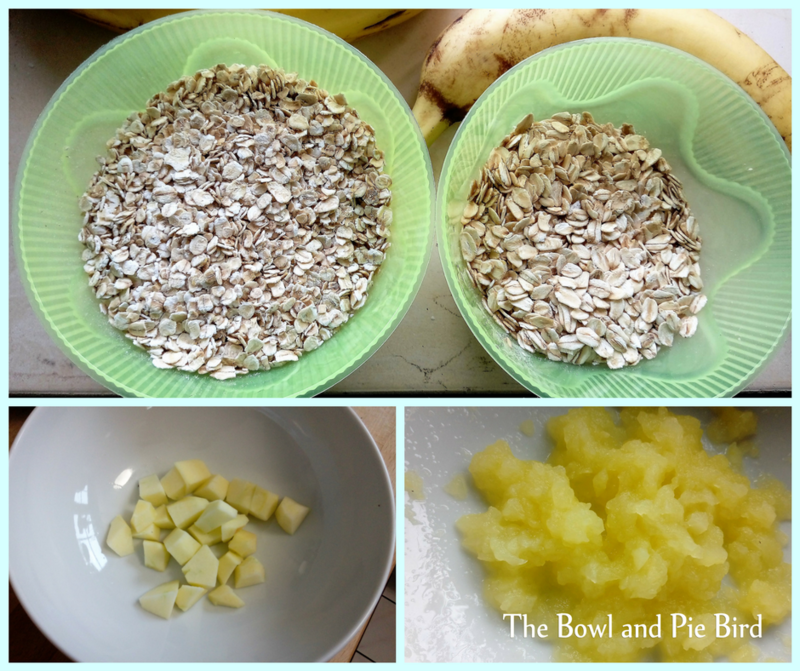 Stir in the apple puree and oats with a spoon and mix until well combined. If you are using cacao nibs, add them now and give the mixture a good stir. Mix the baking powder into the flour and then add into the oat-banana mixture in 3 portions giving the mixture a good stir in between. Bake for 15-20 minutes until slightly brown. These biscuits are moist and filling. More like a musli bar really. They are best eaten the same day I found. The sweetness of the bananas and the coconut flour is very subtle. And eating two at one go didn’t leave me feeling guilty or the need to take a long walk in the dark to burn off calories. One more month and then the worst will be over. Spring will be in the air! 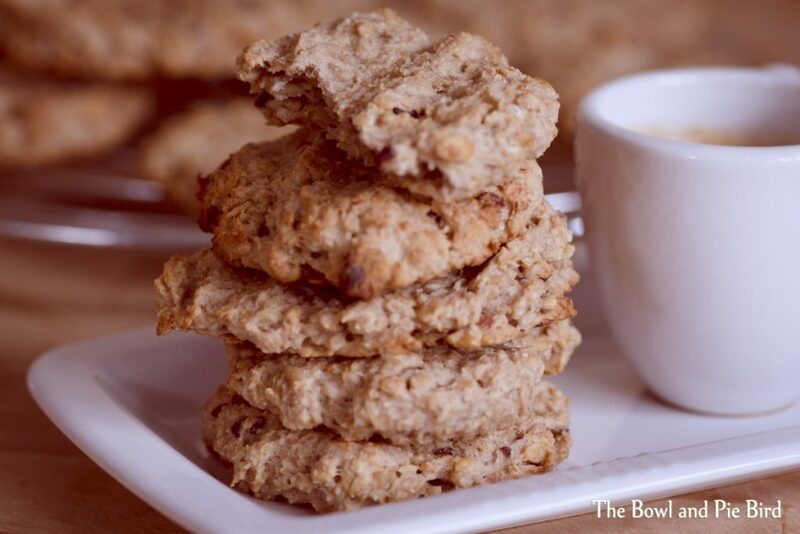 This entry was posted in Cupcakes & Biscuits and tagged Bananas, Bananen, Hafer, Oats, Vegan.